We are playing Cousin Russ' "Who's in my Line?" 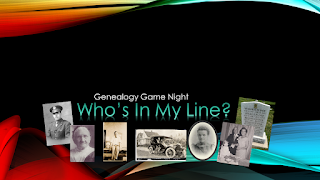 Spotlight an ancestor and see if you can stump the panel. Ol' Myrt actually nearly stumped the panel! Almost! We learned sabout Anna Mathews' ancestor Howard Mathews who was an accountant, but had something to do in support of the Manhatten Project. We learned about Marceline Beem's ancestor Rachel Griest and about scalping and three deaths. My new-found cousin Dave Robison had pictures from his ancestor Clement Alexis Dixon's work on the Trans-continental Pacific Railroad. Cousin Russ talked to us about his new-found cousin Helen Keller. Myrt's challenge to the group? What did my ancestor do to ear 7 shillings 6 pence? It was reported in the St. Tomas [of Garrison Forrest] Vestry Proceedings, archived at the Maryland Historical Society that my ancestor Joseph Gist (1738, MD-1803, VA) agreed to "Tarr the church wall sufficiently and in workmanlike manner."